Buffer is getting all of the attention. You’ve undoubtedly started seeing the Buffer logo popping up in social sharing widgets on your favorite blogs. 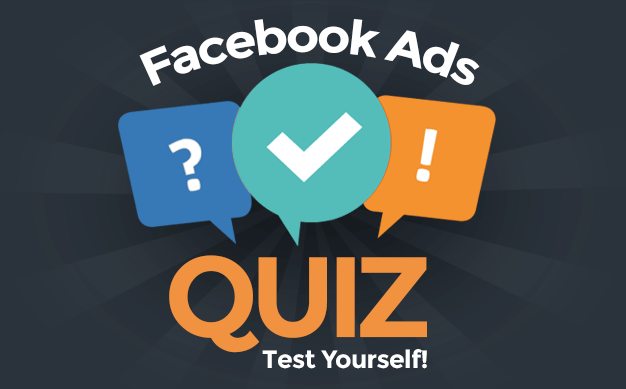 But Timely by Demandforce offers a very similar product. And unlike Buffer, which charges for advanced options, Timely is completely free. Time to take a step back. It’s very possible you’ve never heard of either Buffer or Timely, so you have no idea what I’m talking about. So let me explain. Let’s say you stumble upon a great blog post you’d love to share. But you don’t want to share it right now. If you add it to your queue, Timely schedules tweets at an optimal time. What we do is analyze your past 199 tweets and figure out the best time slots. We then use this info to auto-schedule your tweets and learn as your followers grow. You can instruct Timely to tweet out one, three, five or nine times per day. You can have it tweet on the weekends or completely skip those two days every week. So I have no allusions about this account. I realize that my reach and success will always be reflected by the amount of time I spend on it. That said, a tool like Timely helps me tremendously. Every morning, I read through a long list of blog posts. Most of this happens during a two hour period. I could just tweet it all out then, but that would limit my effectiveness. Timely spaces it out. But the service doesn’t just randomly space it out. It schedules tweets based on when I am most successful at getting replies and retweets. And it’s constantly learning. Because of tools like Timely and Buffer (I do also use Buffer, and I’ll explain why in another post), I maximize my effectiveness on Twitter. I have limited time, but I’m able to routinely share valuable information throughout the day. These tools make what could be a useless Twitter feed something worthy of following. That doesn’t mean that these tools are only for lazy Twitter users. They also complement the feeds of active Twitter users very nicely. Let’s say that you are very conversational on Twitter, but you often struggle to consistently mix in shared links. This will take care of that for you. Buffer offers a free product and a couple of premium options. Since this is a review for Timely, let’s just compare the free products. A “Buffer” and a “Queue” are essentially the same thing. One difference is that you need to determine ahead of time when your Buffer will publish. For example, you may determine that you’ll publish every day at 10:00 AM, 3:00 PM and 7:00 PM. With Timely, that’s all done for you. There are no guesses, Timely is picking the best times. Buffer does offer more flexibility with number of times I post in a day, however. Buffer allows you to schedule anything from one to 10 tweets per day. Timely only offers one, three, five or nine. Timely, though, doesn’t limit the number of tweets you can put in the queue (at least, I’ve never hit it). Buffer’s free product limits you to 10. Both services offer very similar performance statistics. Timely tracks Clicks, Reach and Reactions (which I believe includes replies, retweets and favorites). Buffer tracks Clicks, Potential (Reach), Retweets, Mentions and Favorites individually. I’ve connected five Twitter accounts to Timely, and it looks like I can attach more. There are separate queues for each account, so I can choose the proper account each time I add a tweet. Buffer’s free product limits you at five. Not much difference there, assuming you don’t have a slew of accounts to manage. 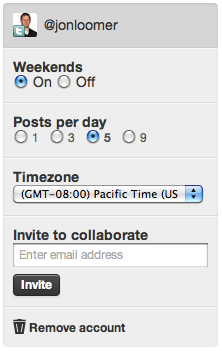 You can have at least three collaborators (that I’ve added) for a single Twitter account within Timely. The free Buffer product limits you to two team members. Buffer allows you to use your own Bit.ly account to shorten links. Timely uses Awe.sm. Both Buffer and Timely offer shortcuts that you can add to your browser to easily add tweets to your Buffer or Queue. Only Buffer is regularly found in social sharing widgets. Like Buffer, Timely has built in analytics. Buffer, though, doesn’t find ideal times to Tweet. I have to determine what those times will be ahead of time. I’ve been tweeting out three times per day with Buffer (8:09 AM, 12:38 PM and 8:39 PM) and five times per day with Timely (the times are constantly shifting). Now, like I said, my results overall aren’t very good. But I don’t search out conversations on Twitter right now. I respond to people as they tweet at me. And I do regularly share the posts of others. Yep, bad numbers either way. 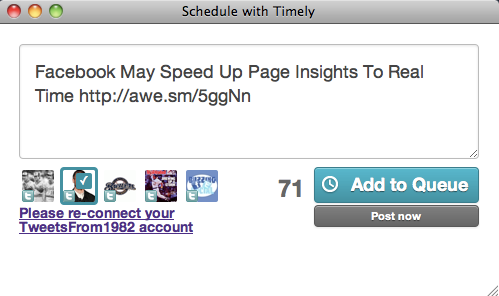 But Timely is giving me a click per link I share while Buffer is giving me .75. At another time, I’ll explain how I use both of these together. But for now, let me just say that Timely is an extremely valuable tool. It offers nearly everything that Buffer’s premium products do, but it’s completely free. No limitations. That’s not to bash Buffer. But I personally see no reason to purchase their premium memberships when Timely will likely give you everything you need. What do you think? Are there benefits of Buffer that I’m missing? Have you tried Timely yet?